Here's a Jonah-themed piece I created, and am still trying to figure out what to do with. Pardon the lack of good grammar there. While Jonah was sojourning in the big fish (or whale, if that's the way you interpret it) the fish gives him a big tour, showing him all sorts of water-related things -- represented by the patterns and comic textures you see here. 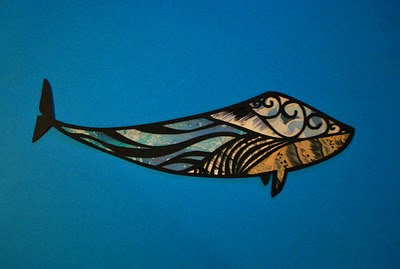 This "Big Fish" is going to be in my show somehow. "What show?" you may ask.